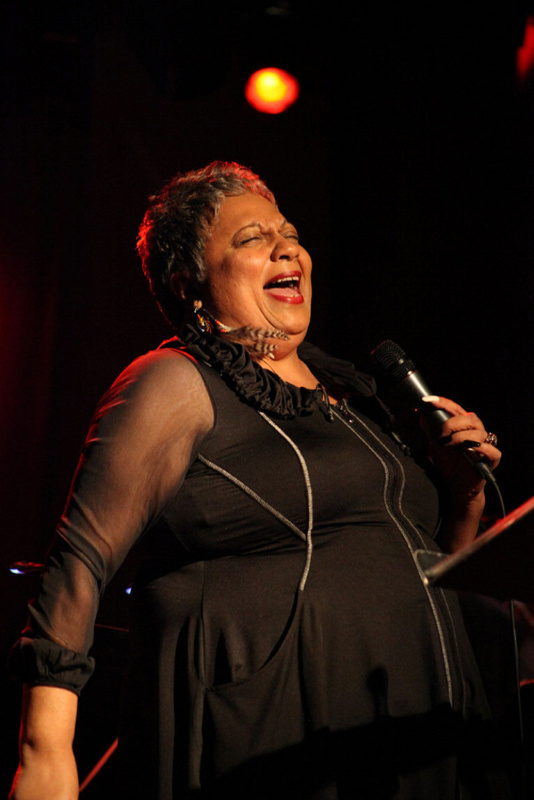 The Global Cabaret Festival came to an end with a rousing late-night performance from the great Jackie Richardson. I celebrated the first seven shows on my agenda in Part 1. Now that the festival is over (hopefully not forever- Global, tell us you’ll bring the festival back for year 8! ), here are the rest of the highlights from my 3 days and 13 shows at the Young Centre last weekend. I don’t mean “attitude” in that she has a “good attitude” (that honour probably belongs to one of those super chipper people like the indefatigable Suba Sankaran); I mean “attitude” in the way that teenagers who are about to turn into really interesting people are told they have too much of it. Molly Johnson is all sass, sarcasm and refusal to take herself or anything else too seriously. Essentially, she’s a hoot. She also can sing like such a boss that Jackie Richardson herself declared from the back row “I’m telling ya!” after Molly’s first Gershwin solo (“I Loves You, Porgy”, down the octave where it’s so much better). In Part 1, I awarded the astounding Hailey Gillis the honour of Best Vocalist for her performance in The American Pie Songbook (and I hadn’t even heard her in Dido & Aeneas yet!) but I thought about it some more and figure, the male and female voice are such different instruments, I’d better point out the achievements of the best male singer at the festival if I was going to highlight the female (“best” is subjective but I’m going with it anyway). The first time I heard Alex Samaras sing was in 2008 (or thereabouts) in a concert dedicated to “b-list” Disney songs (yes, it was as fun as it sounds). In the years that followed, I’ve heard him sing jazz, pop, folk and every style in between, but my favourite showcase for his fine tenor has always been the American standard and musical theatre styles he always seems to come back to at The Global Cabaret. In past Octobers, Samaras has been at the Young Centre to lead the choir, soloing very occasionally, but this year musical director John Alcorn gave him his long-overdue spotlight in The Gershwin Songbook (a spotlight further brightened by his charming turn in Dido & Aeneas). A superb technician, Samaras showed off the oft-sung Gershwin classics with stellar range and achingly beautiful tone. With a Soulpepper Cabaret Series showcase already under his belt, the company should be keeping their eye on Samaras if they’re looking to replenish their crew of musical resident artists. Even with Global Cabaret’s favourite fiddler Miranda Mulholland absent this year, the string players stood out more than ever. Violinist Sonia Shklarov came very close to stealing Webster’s Opera Corner from the amazing singers and adorable Webster, the bassists were killing it across the board, and the amazing quartet that anchored Gregory Oh’s ambitious 21st Century Remix of Dido & Aeneas delivered some of my favourite moments of the entire festival. First violin Carol Fujino and cellist Kerri McGonigle, in particular, were breathtaking. “Sing along with the chorus, I believe you know the word” was O’Callaghan’s instruction when her Schubert-related introduction revealed that Cohen’s greatest hit was next in the lineup. Surprised to see it so early in the show, the (remarkably elderly- average age about 70) audience whole-heartedly droned along to the beautiful tune. The rousing “American Pie” chorus came second because it had the benefit of a lot more buildup (an entire cabaret’s worth). Ridiculous pantomime, weak narration, and tangential video projection contrasted with sublime dance sequences that were as emotionally riveting and revealing on a story and character level as the rest of the show was confounding. Most Global Cabaret shows are single-performer spotlights or a collection of artists assembled by a music director, each assigned a few solos and maybe a duet or two. What I like about Broadsway (despite its misleading billing as “Heather Bambrick and Broadsway”) is that it’s all about the three members working together. The banter is key to their performance and all three are onstage together the whole time. They each have great voices (and Diane Leah sure knows her way around a piano; see her pounding away at JRB’s “King of the World” if you have any doubt) but what they do best is harmonize, which they do in nearly every number. Y’all know Colleen Allen and her saxophone(s), right? Good news, she’s still made of perfect (specifically in The Gershwin Songbook but also in general). Backed up by the best piano and bass combo at the festival, Jackie was nothing short of wonderful as she brought the house down at the weekend’s final concert (her second of the day). Swinging from fun, funky and thrilling to heart-stoppingly sincere, each song sung by the jazz monarch gave us something fresh and awakening. There comes a point in a career like Jackie Richardson’s when you’re expected to slow down. Your voice is expected to wobble and fade, your enthusiasm to wane. You’re not expected to show up for (let alone cheer wildly for) any shows but your own. You’re expected to get by on your name and the memory of the performer you were. Jackie effing Richardson won’t have any of that. She still bops around that stage like she’s hearing her band jam for the very first time; she talks to the audience like they’re the most interesting people she’s ever met; she still sings like the words are coming straight from her heart, and that voice still hits the back of the theatre like the straightest and truest arrow ever shot. My schedule at this year’s festival was nearly perfect- I had to sacrifice my Sophie Milman tickets in order to catch Dido & Aeneas but otherwise the only shows I missed were ones I’d seen before (Judith Lander and Lost Songs of Toronto)- and I think I finally cracked the code to a perfect Global Cabaret weekend: take risks in the middle and see as much as you can (who knew Webster’s Opera Corner would be one of my favourites?!) but, to ensure perfection, start with Mike Ross and end with Jackie Richardson.